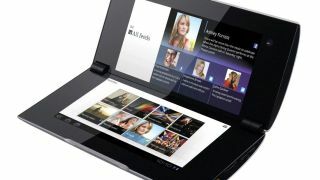 Owners of the Sony Tablet P are finally seeing the Android 4.0 Ice Cream Sandwich update roll out after months of waiting. before the month was out. We then heard the roll out to the Tablet P had experienced a delay until May 24, but it's taken until now for ICS to arrive. Sony has spent some time tweaking the Ice Cream Sandwich update for its tablets, with the unique, dual-screen offering of the Tablet P probably the reason why its roll out has taken a little while longer. Users will be greeted with version 4.0.3 of Google's latest operating system, as well as a variety of new features courtesy of Sony, including enhancements to the web browser and a camera shortcut key on the lock screen. Although there's been a delay, some of Sony's other key products are still waiting for Ice Cream Sandwich to hit, including the flagship Xperia S as well as the Xperia P and Xperia U.